The following schedule shows a case in which a critical resource assignment does not belongs to a critical activity [Activity 1] by definition of Critical Activity Float [start/finish/both] and does not belongs to a Longesth Path. Actually, I was trying to understand Assignment Floats as described in the Advanced Features of SpiderProject slides; by mistake, I had in mind that the Resource B was delayed and not leveled on Activity 1. Now, I am OK with this point. I always found resource leveling on Strict Links unreliable. Look at the links table, it does not disclose a strict link was broken. I believe it is possible the links table value might be fixed as well as the resource leveling report that shall warn when a strict link was broken and suggest investigating on the links table. I agree that at times what seems like a perfect solution can create more issues than those it solves. I believe the use of maximal lag to model strict links can create more problems, especially when using Monte Carlo because it can create multiple impossible links. Spider strict links are not perfect but they are a sensible solution to a difficult issue, with some expanded reports it is possible this approach can be improved. After you identify the broken strict link you can figure out a fix as shown in next figure, a fix that did not increased project duration. long time ago we decided to remove this functionality from Spider Project. When it was available people created long activities with fractured resource assignments and it made project models smaller but much harder to analyze, a lot of information became not transparent and problems exceed benefits. I know of no single software currently available that levels such condition, as soon as you apply a resource curve or its equivalent these resources are not leveled. This is not known by everyone and it is a dangerous situation that might led you believe the schedule was resource leveled, when in reality it was not. You can fix the duration of each team but not when, it will be determined to be ASAP as per resource leveling algorithm. Spider Team opted not to provide for such misleading option. If using manual leveling then using two activities will not make any difference. btw, day 14 is 4 days after the finish date! 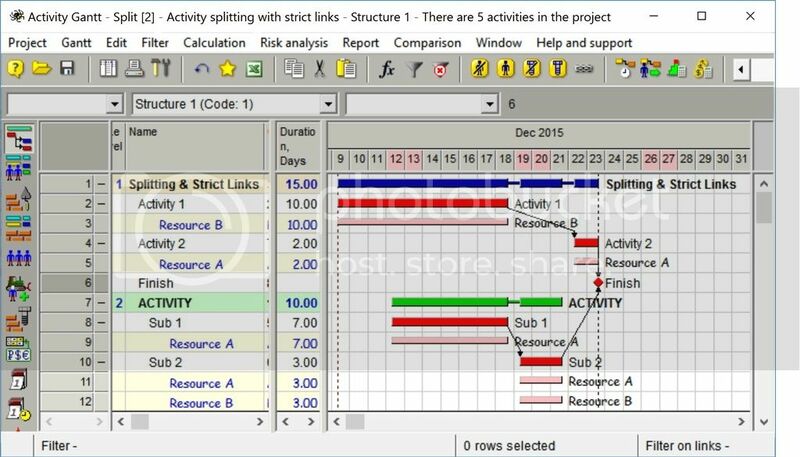 In Asta PowerProject you can just split the task into two sections on the same line and assign resources independatntly. I can't see any other options other than splitting the bar unles you apply 70% of resource A and 30% of resource B. That leads to the question who is working on the 14th day? Can Spider change the % of assignment, when doing resource leveling? Dummy resource to model resource sharing among Shifts.